Breaking Games has been a roll lately not only with great games but getting those games into retail. One of my favorites of theirs to hit store shelves? That’d be MoonQuake Escape, now on over 650 Barnes & Nobles store shelves. 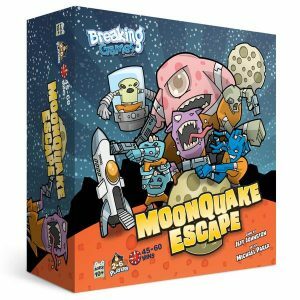 In MoonQuake Escape each player plays a convict on the prison planet of Zartaclaton. A major quake has put the plant into a tailspin, freeing the prisoners and having them all scramble to try and use the last escape pod to get outta dodge before everything goes bottom-end up. It’s not a straightforward race for freedom, though. The planet’s surface is constantly shifting, making it difficult for the convicts to make their way to the pod. Toss in a prison guard that’s still operational and they’ve got quite the task to accomplish. MoonQuake Escape’s board is made of several rings that are stack on each other so they can spin. This represents the unstable nature of Zartaclaton. Each turn players will get a certain number of charges to make various actions: moving, playing cards, peeking at other player’s cards, escaping hazardous territory, etc… Players keep played cards, except equipment, face down. One of these cards is their alien convict. The only way to move and eventually escape is to keep this card hidden. If it’s revealed you’ll have to take some penalties and get it hidden again to progress through the game. This makes bluffing very important. Have a shield card? It may be too obvious to protect your alien, but placing it elsewhere may open you up for discovery. Overall the game is a great time. It’s silly fun with a good mix of chaos and strategy. It’s more than just a cool gimmick. It’s a solid family game that I know I’ll keep coming back to with my kids.